Live the liquid lifestyle with the Floating Key Buoy. The LFLOATY keeps keys afloat if dropped into water, while a TYR logo and red hue provides a cool, authentic look! This is the perfect gift for swimmers, lifeguards and coaches! I havenâ€™t tested it out, but it is perfect size! I love it. I was worried that it might be too big and bulky, but it's fine. 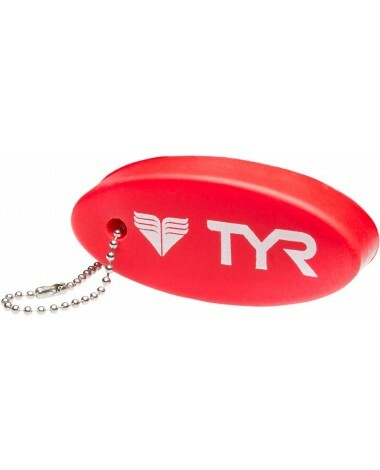 I swim every day and I grew up around a pool so I am aware that keys do make it to the bottom of the pool so I got one for when I'm going thru my gear and just in case a accident happens. I just hope somebody doesn't say hey why do you carry around your boat keys but hey you know boat keys are the little bobber. thanks TYR. They're fine I carry them in my jeans pocket and and i can't even tell so right on.I love em. Saved my keys at the lake more than once. Good buy. Q: How do you get your key or keys on to this item? A: Your keys are easily linked through the chain that is attached to the Floating Key Buoy.